I totally forgot to post this on Wednesday. I had Monday off and my mind has been in the wrong day ever since. So it goes and on to the fun stuff. I went looking for this issue a few weeks back when I heard an interview of Paul Dini and then later Mark Hamill. Paul Dini was one of the main writers on Batman: The Animated Series and Hamill, of course, has been the voice of the animated Joker since the series premiered in 1992. One of the major things to come out of that series is the character Harley Quinn. Harley started out as just another Joker henchman…henchperson but quickly because The Joker’s “girlfriend” and a recurring character on the show. Harley has grown to have an entire fan base of her own and is now a favorite among Batman fans. Most recently she has been seen in animated form in the video game Batman: Arkham City. 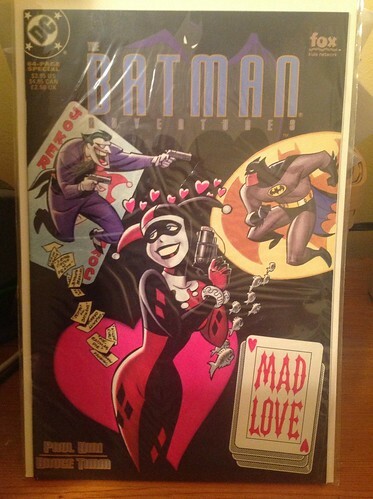 Mad Love tells the origin of Harley Quinn. Although she was first introduced in the cartoon, Dini and series creator Bruce Timm used The Batman Adventures comic to explain how she became the twisted sidekick of on of fictions most crazed villains. The story was so popular that it was eventually made into an episode of the show and it regularly reprinted as its own graphic novel and as part of compilations. Although Mad Love is, on the surface, about Harley Quinn, I find it is one of the better Joker stories out there. We find that The Joker tolerates Harley but he is really only interested in Batman. Even when Harley captures Batman and hands him over to The Joker, The Clown Prince of Crime only sees that he wasn’t the one to deliver the punchline and subsequently boots Harley out of a window. It is clear that The Joker is obsessed with The Batman and Harley is just as obsessed with The Joker, so much so that she can’t see how bad he is for her. Really great writing and oddly dark for a series sporting the Fox Kids Network logo. I hadn’t read this story since I first got the issue back in 1994. It is really enjoyable in both art and story. Dini and Timm obviously had a little fun with this one and their love of the characters really comes through. I have most of the original run of The Batman Adventures and now I feel the need to go back and read them all again. I’d also love to get the animated series as it has been many years since I have seen any of those episodes. I gives this one a big thumbs up.